INTRODUCTION: Intraoperative cholangiogram (IOC) is a study performed during cholecystectomy in order to visualize the extrahepatic biliary tree. Some authors recommend its routine use, while others prefer its selective use. The objective of the study was to analyze associated variables of patients who underwent routine (IOC) in one institution. METHODS: We analyzed 2419 patients who underwent cholecystectomy and IOC between October 1991 and November 2008. The study included female and male patients, 18 years or older. Pre, trans and postoperative variables were analyzed. RESULTS: We performed 2419 (91.3%) successful IOCs. In 506 cases (20.9%), we suspected common bile duct stones. While performing the IOC, in 198 cases (8.2%) there was suggestive evidence of stones. Common bile duct exploration showed 82 cases (3.4%) with one stone, 98 (4%) with multiple stones, and 18 (0.7%) with no stone (false-positive). This procedure was performed trans-cystic in 54 cases (2.2%), through common bile duct in 134 (5.6%), and in 10 (0.4%) started as trans-cystic but ended as choledocotomy because of transoperative difficulties. From 180 cases that presented with stones, 138 cases were suspected preoperatively, (5.7%), and not suspected in 42 cases(1.7%). Median surgical time was 57 minutes (1SD ± 39). No complications were reported during intraoperative cholangiogram. 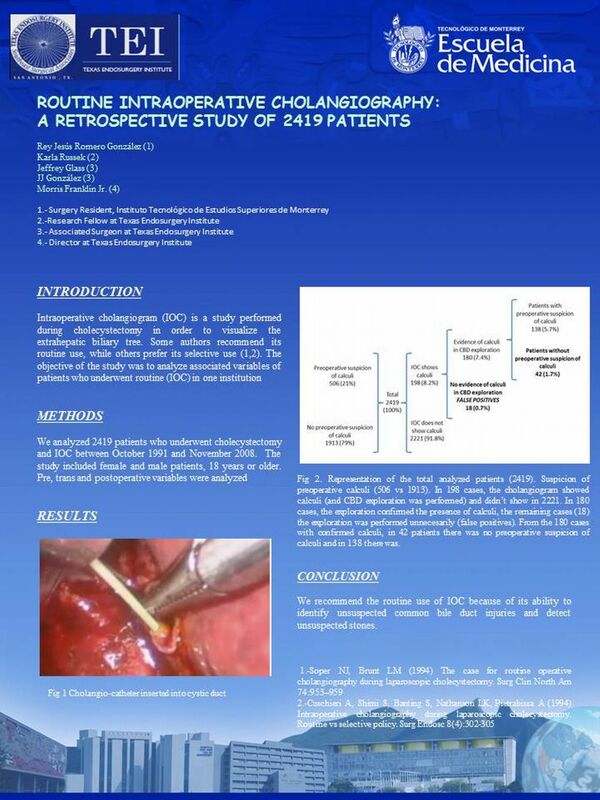 CONCLUSIONS: We recommend the routine use of IOC because of its ability to identify no suspected common bile duct injuries and detect no suspected stones.